At age fifteen, Crystal Frost discovers she can see into the future, witness the past, and speak with the dead. Secrets begin to uncover themselves wherever she goes, but secrets can be dangerous. The lives of a classmate, a child, a stranger, and Crystal herself hang in the balance. If she doesn't embrace her psychic abilities and follow her instinct, she's not the only one who will get hurt. 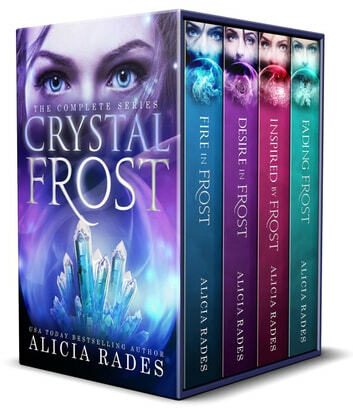 This box set includes all four books in the Crystal Frost series by USA Today bestselling author Alicia Rades—plus a Crystal Frost bonus short story! I loved this set of books. I enjoyed the twists and turns each story told and the good thing was that the next book had a different story to tell. Great read. I'm now on to the next couple of your books. With Kai and Colin. it’s my first time reading a series from Alicia Rades. I can say I really enjoyed the Crystal Frost series. the pace of the story is just nice and the characters are well built. hope to read more from this author. This books rock! I love it so much and the last book got me nervous as I further reading it.